The Hole of Horcum was formed by rainwater seeping through porous rock and when this water reached a layer of clay it was forced to the surface as springs. These springs caused many landslides gradually making the hole bigger, but legend says that the giant Wade picked up a clod of earth and threw it at his wife and where it landed it made both the Hole of Horcum and Blakey Topping. At certain times during the summer the fields of Horcum are grazed with sheep to allow the wild flowers such as the white pignut, the yellow buttercups, the blue betony (with healing properties), the harebell (wild hyacinth) and the devils bit scabious (member of the teasel family) to bloom and seed. Therefore in the spring and summer the Hole of Horcum is ablaze with many colours. Then in late summer the hills are covered in purple heather which is an amazing sight. There are also plenty of wild life such as Deer, Grouse, and rare birds, including curlew, lapwing, merlin, golden plover and also hedgerow birds. The views from Saltergate car park and on the whole of the walk are spectacular whether its winter, spring, summer or autumn, so take your camera. Levisham is a pretty village with a long wide village green and as we enter from Dundale Pond the Horseshoe Inn is situated on our right and if you go to the other side of the Inn there is a road that stops at Levisham Station, from there the road then becomes a paying toll road into the forest. The Horseshoe Inn is also a place to stay with double and twin rooms, all with en-suite facilities and the breakfasts are fantastic. There are several B&B’s too. 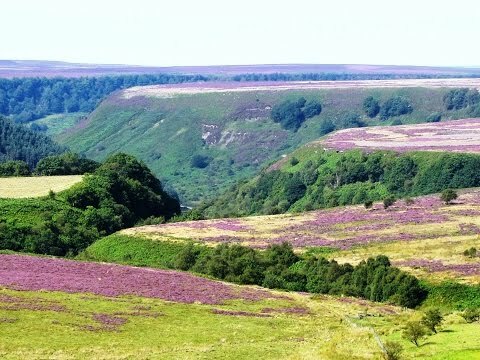 Levisham is a perfect base to explore the North York Moors whether walking or using your car. The brother owners also have the Fox and Rabbit only a few miles away on the A169 Pickering to Whitby road which caters for special occasions, private parties and functions for up to 75 people. We park in the car park at the top of Saltergate Bank, cross over the road and follow the path to the right until we reach a gate. We go through the gate and take the Tabular Hills Walk straight ahead, taking us along the top of Horcum and Levisham Moor to Dundale Pond. At Dundale Pond there is a cross roads of five paths with a signpost, we take the path to Levisham. At Levisham we go straight ahead through to the end of the village and take a path to the left. We take the path that bears to the left, not the right, and we keep bearing to the left along Levisham Brow and follow the sign to the Hole of Horcum, going up and down several gradients, until we come to a gill with a path to the left which goes to Dundale Pond but we go straight on down into the valley bottom. In the valley bottom we cross Levisham beck and a small bridge and follow the path with a steep drop with Levisham beck on our left, so please take care. We then follow this path to Low Horcum, a disused farm house building built in 1811, and still standing, which has now been converted into a place where birds can nest and breed. We then proceed forward to the scared hill path up to the gate where we started off and take the path to the right back to the car park. This is a moderate walk with some steep inclines and declines. Easy walking along the top of the Hole of Horcum and down in the valley. Approx 7.25miles using OS map OL27. From York take the A64 and turn off onto the A169 to Pickering. On reaching Pickering go straight on at the roundabout staying on the A169 towards Whitby. Travel on this road for about 7.75miles and Saltergate Bank car park is on the right. There are no public toilets. For refreshments there are two pubs, The Horseshoe Inn, in Levisham and the Fox and Rabbit on A169 only a few miles away.